instaDM for iOS has made quite a splash, since it’s recent debut as an Instagram client enabling direct messaging capability. The free instaDM iPhone app currently runs via donations from users. You gain badges related to the level of your contribution, but your donation is not required to access instaDM functionality. instaDM has clean, efficient interface similar to the current text messaging capability of your iPhone. 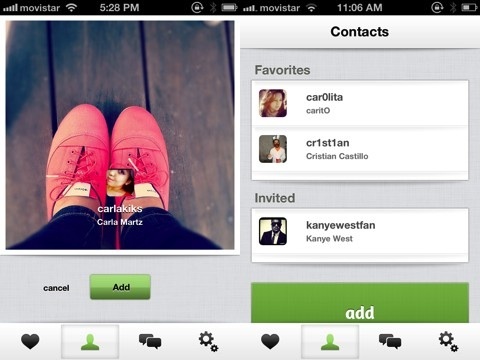 You allow instaDM to access your Instagram information, and you invite Instagram contacts to instaDM. You should enable push notifications with the instaDM iPhone app, so you will know when your contacts have accepted your invitation. After your contact accepts, you simply start a direct messaging conversation. Again, a push notification is sent to your contact, so you can keep the conversation rolling. The conversation’s visual impact is similar to your iPhone’s text messaging screen. Your Instagram profile picture follows your words, and your contact’s follows his or hers. As a frequent Instagram user, I have never missed this direct messaging capability. I tend to engage with my Instagram contacts through Twitter and Facebook, when the Instagram photos appear in my feeds. Although instaDM is simple and effective, you have to be supremely addicted to Instagram to add another direct messaging application. Does the instaDM function well? Yes. Do you need it? Mmm, maybe? In related news, Facebook has acquired Instagram for $1 Billion today. If you want to get your existing photos out of Instagram & avoid them going sucked into your Facebook account, try http://instaport.me which lets you download a zip of your photos. But you can expect long delays in the mad rush right now. 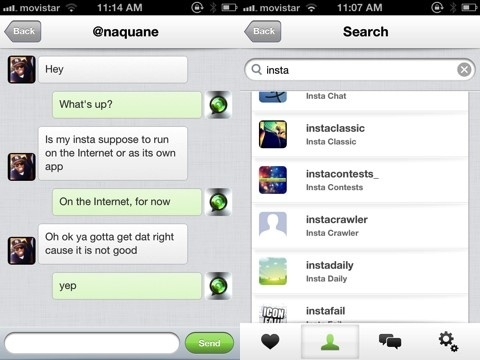 AppSafari review of instaDM was written by Jenni Ward on April 9th, 2012 and categorized under App Store, Chat, Social. Page viewed 8694 times, 3 so far today. Need help on using these apps? Please read the Help Page. How do you delete a friend from instadm? This app is horrible. It won’t even work. All it says is tweet and follow. This is obviously a poorly made app beta. The whole purpose of this “app” is to chat and that is not even an option. I give it a 1 out of 5.